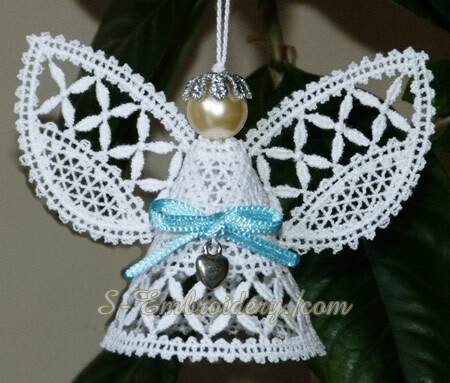 This Christmas angel in Battenberg freestanding lace machine embroidery is delivered in 2 versions - single color and 2 colors. Using it, you will create a fine 3D Christmas ornament. 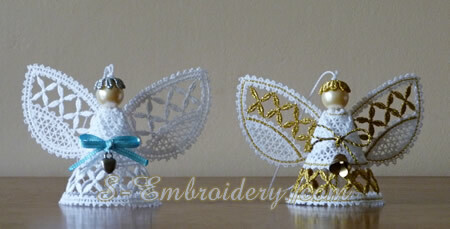 The ready angel would be approximately 2.4 inches (6 cm) high and 4 inches (10 cm) wide (with the wings spread). Each of the 2 versions of this ornament comes in 2 parts - an angel body and the wings. The nimbus is the same for both versions, so you receive a total of 5 machine embroidery files in one of the supported formats. All parts will fit in 4x4 hoops. 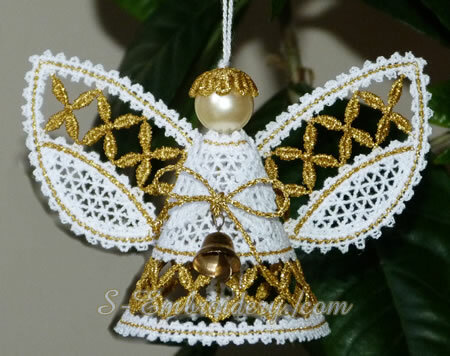 Along with the 5 machine embroidery files you receive design information and instructions for creating the angel ornament in PDF format. Scroll down for larger images.